If you want to create a statement with your next project, you should consider the EKU Frontino 40 sliding system from Häfele. 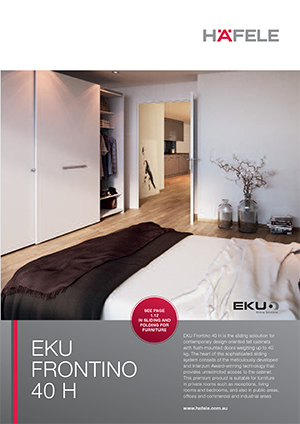 A masterpiece of modern engineering, EKU Frontino 40 sets a new benchmark in architectural design by using a unique flushing feature to eliminate the traditional step between doors. The result? Natural continuity of space that makes cabinetry appear an extension of the building. This is a product that’s meticulously developed to provide easy installation and suits just about every dimension possible. Winner of the 2014 Interzum award for outstanding quality and innovation, EKU Frontino 40 handles a maximum of 40kgs per door, and is perfect for both commercial and residential applications.